This is looking straight at the Koala cabinet I sew on. You can't see all of the plastic bins on the shelf behind because of the design board being up. 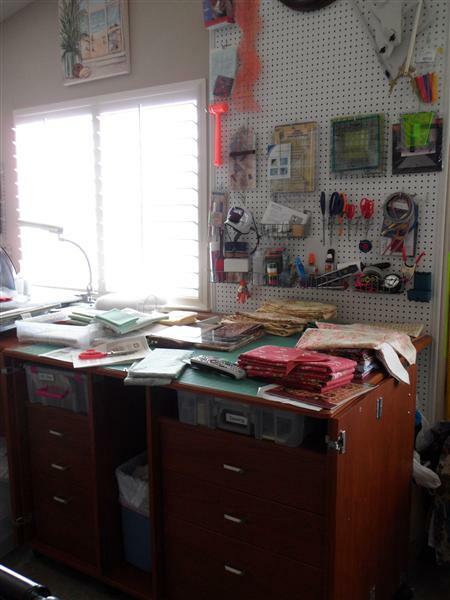 The Studio Cutter is to the left and there is a closet with shelves to the right. The shelf with the rectangle of fish fabric is my computer. My most current quilt magazines are in front of the cabinet and organized. I cut up my old cutting mat to cover this cabinet in hopes of protecting the top. I also like to cut some there. 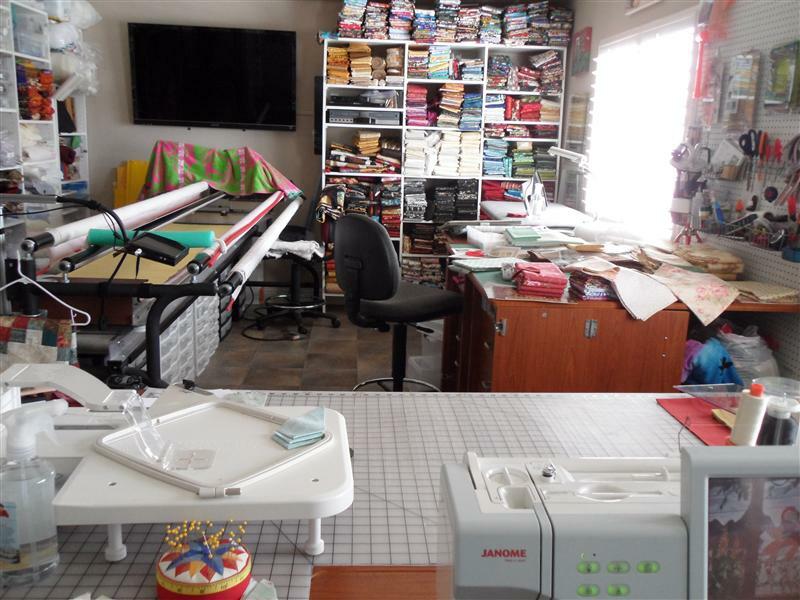 I'm working on several projects at the same time and that's why I have my embroidery unit out and the serger setting out and another sewing machine. 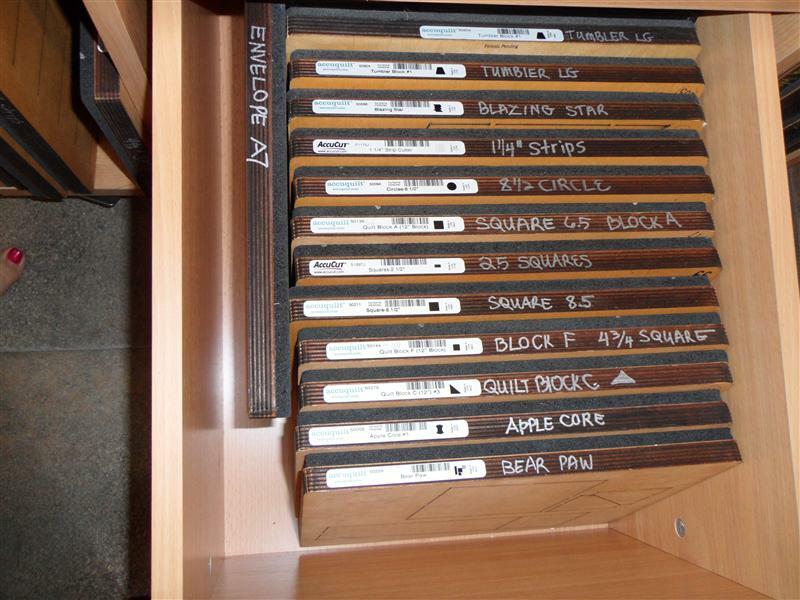 This is a close up of the Studio Cutter cabinet. 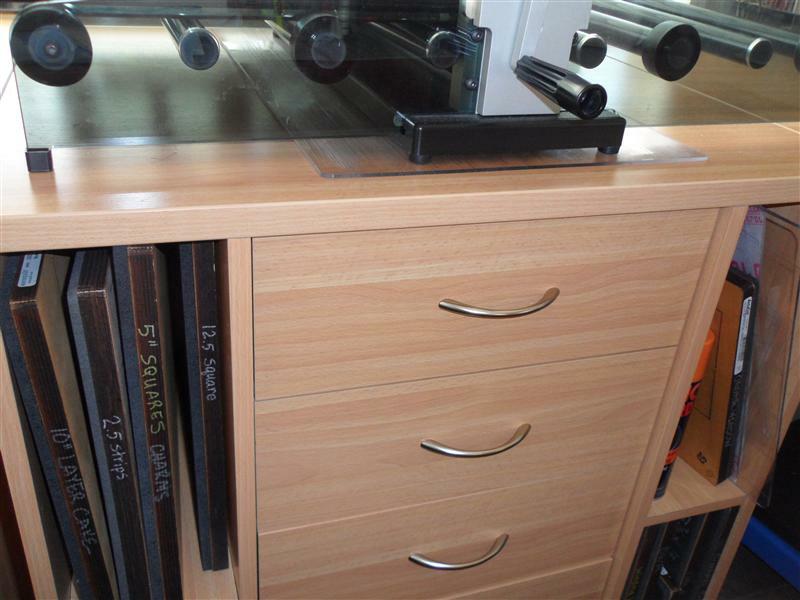 It doesn't match the koala cabinets, but it is well made and is PERFECT for all the AccuQuilt stuff. I found it cheaper than the AccuQuilt site and free shipping and NO tax! The price was great! This is the front of the sewing cabinet. Better pic of the floor. I have my Perfect Circle on the floor under it. I said I wasn't going to do that, but it fits. See that white extension cord hanging on the side? Well, that doesn't need to be because I had a four receptacle plug-in put under my cabinet all I have to do is bend down there and plug it in. I'll get around to doing that in a few days. See that just proves I'm not some "perfection freak". You are a lucky lady!!! This is the other Koala cabinet. Try to see past the mess. I'm working on a quilt so I don't want to move stuff. That's my excuse and I'm sticking to it. LOL. You can see the peg board in this pic too. This is all three cabinets. 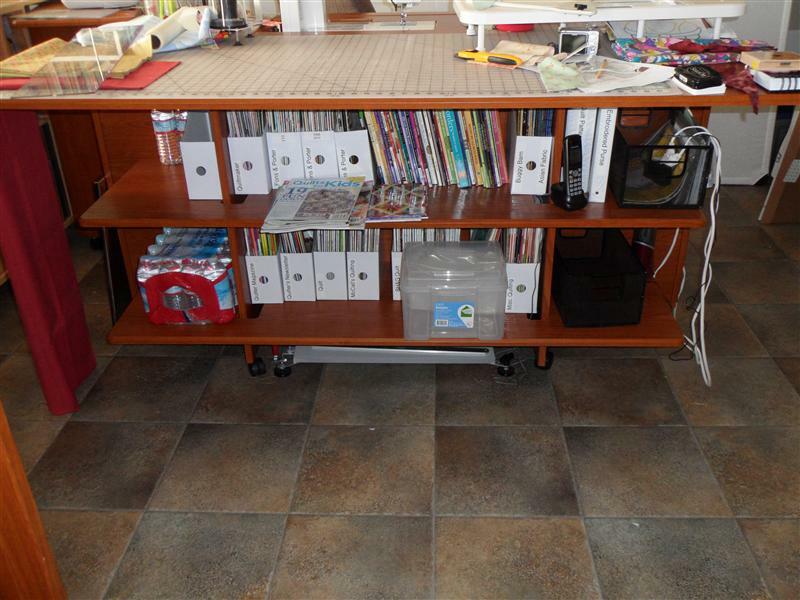 I like that the sewing cabinet has the shelves on the side that swing out (under the serger). I can pull it up close if I'm using the serger or push it out of the way when I'm not without having to lift it out of the way. 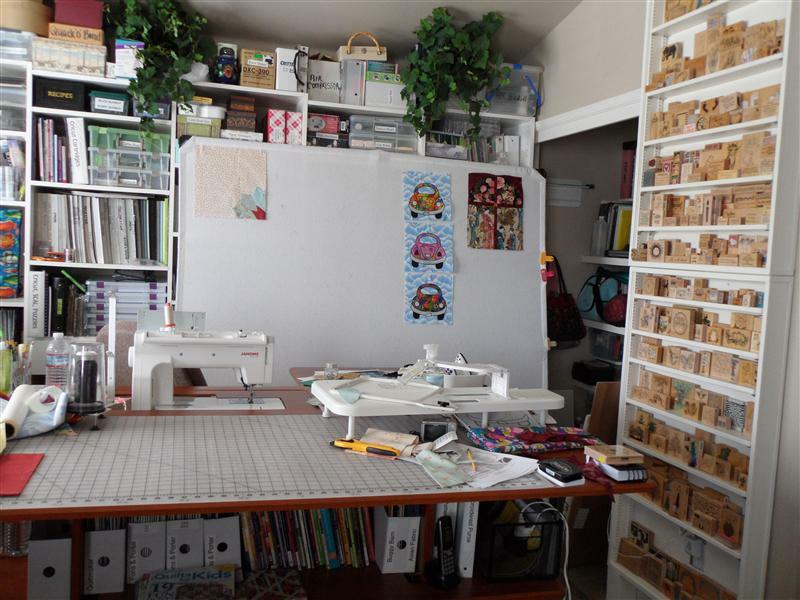 There is a bullitin board to the right of the window that I used thumbtacks to attach patterns of my NEXT projects or at least the ones I REALLY want to do. Keeps me motivated. 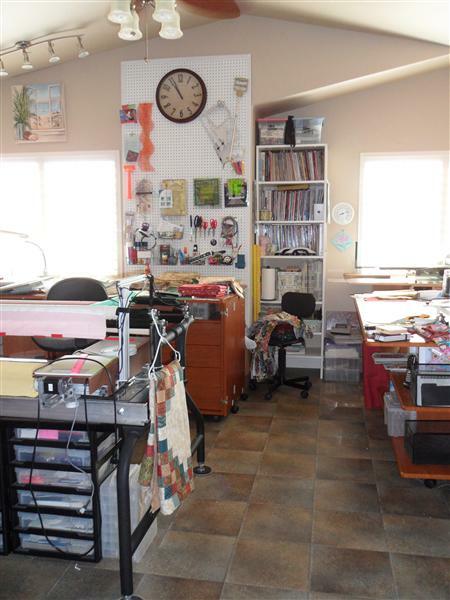 Here's a pic showing the rubber stamp wall. Those would make great thread shelves if I had that much thread. The shelf looks like it is leaning, but it isn't...it's attached to a wall and the wall is straight. There are a lot of little plastic containers behind that design wall too. 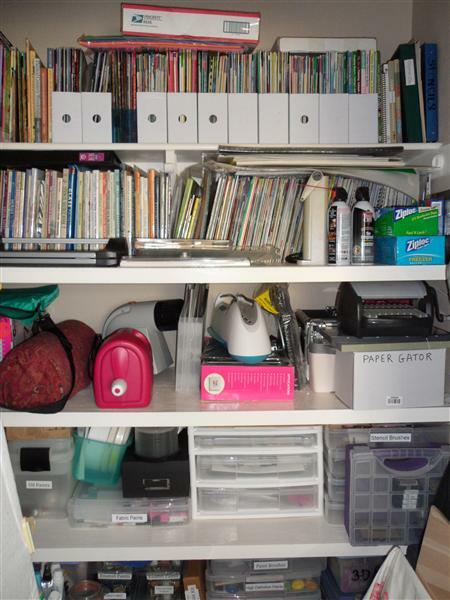 All my scrapbooking and paper crafting supplies are there. 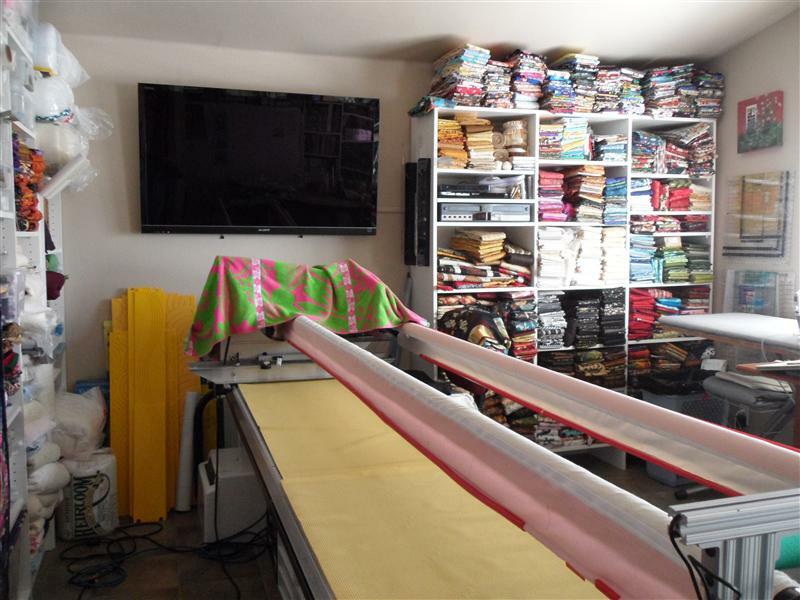 Now I'm swinging across to the cutting table, ironing board and fabric wall. I went through a bunch of my fabric and sent it to my DIL along with my older Janome embroidering/sewing machine. She needed something to play with and I needed to lose some of it. I still have several shelves of fabric on the wall behind the Liberty. This is enough to keep me busy for a while anyway. Under my Liberty. Love that storage. I LOVE that big screen tv. You can see my CL boards. Later I may find a different place for them. To the left is a 12 foot long wall of shelves also. I have most of the stuff in plastic containers separated out. Probably 10 -12 quilts with all the fabric for them in each container so all I have to do is pull out the container and there is my pattern and fabric all ready to go. 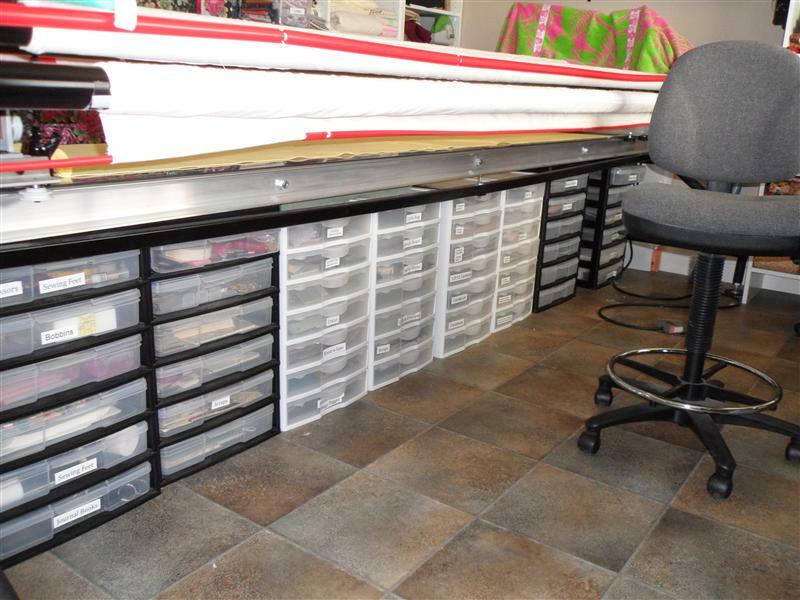 All my longarm supplies are on those shelves. And batting and over flow fabric and bunches of other stuff. 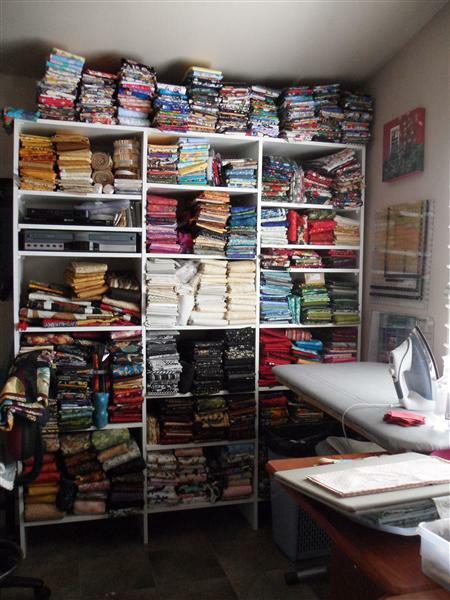 I still have the yellow cabinet liner on the table bed because I had a quilt on the machine. 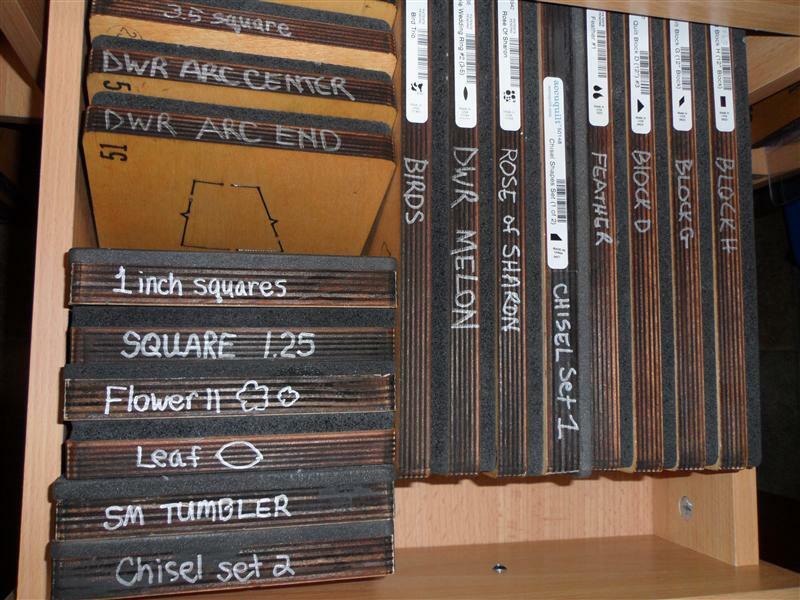 Some of you may remember my story about the CL boards and the carpet tape. OMG! Well, this has fixed everything and is working well. If all else fails...read the instructions again! 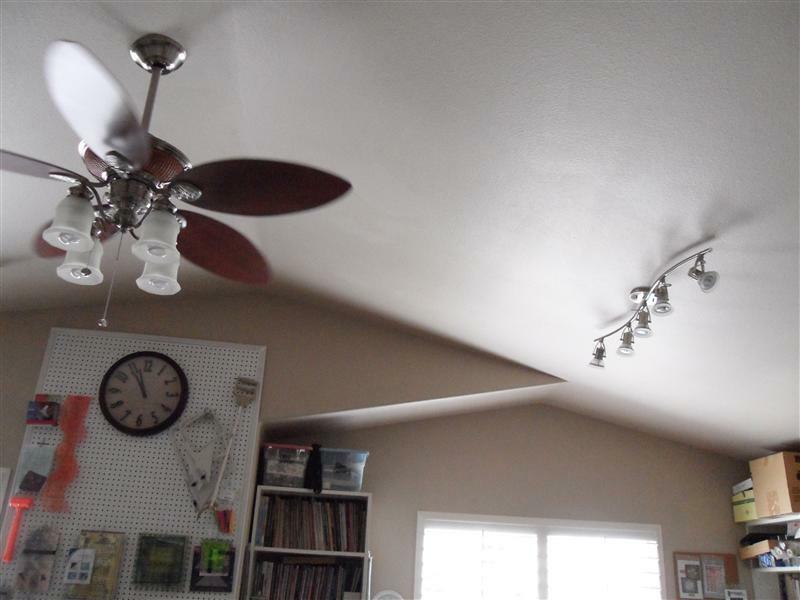 The lights and the fan. They are working well. 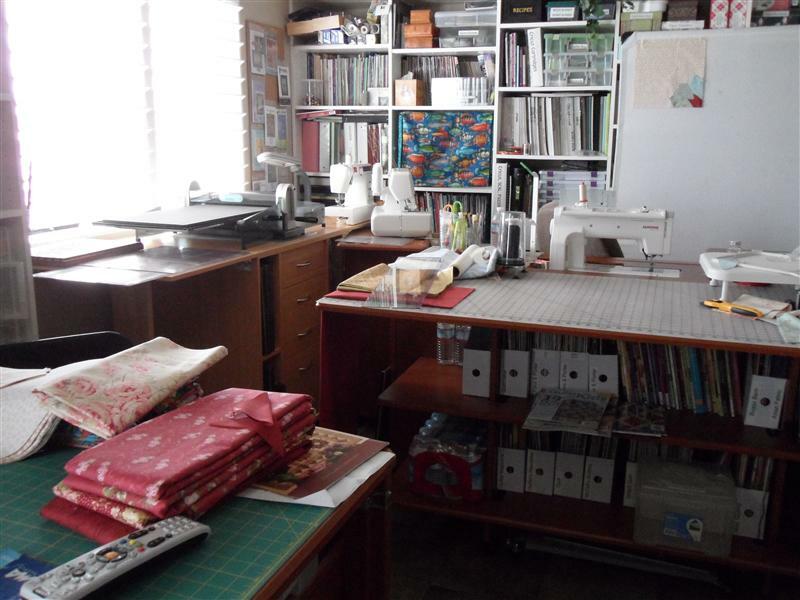 I have them over the top of the quilting table, the cutting table, and my sewing table. 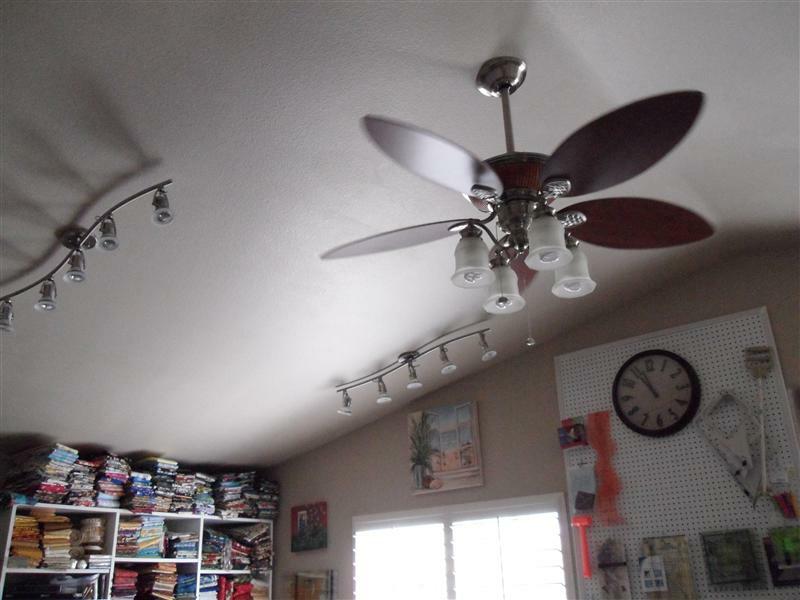 The ceiling fan light fills in the middle. 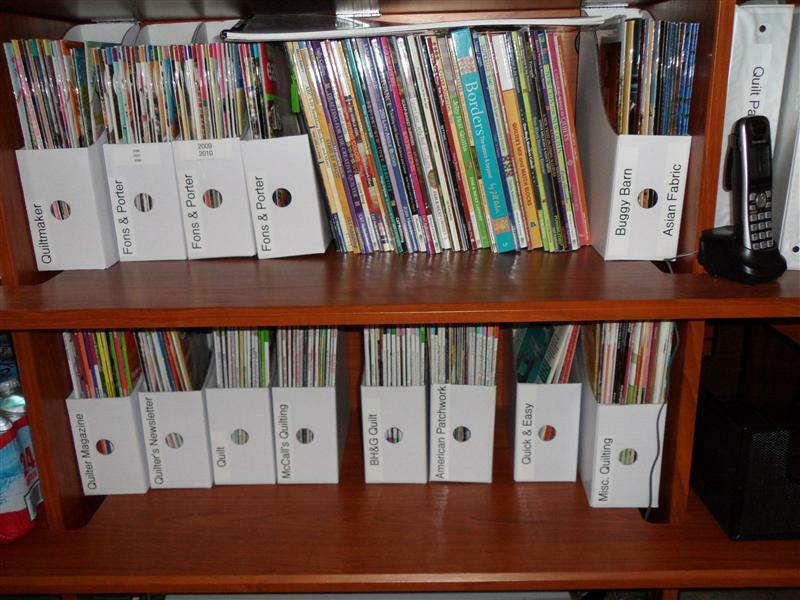 The organized magazines up closer. I like being able to go find a certain magazine this easily. I also have a little foot stool I sit on when I'm looking through them. No one looks through just one. The closet shelves. This is mostly painting stuff and scrapbooking stuff. 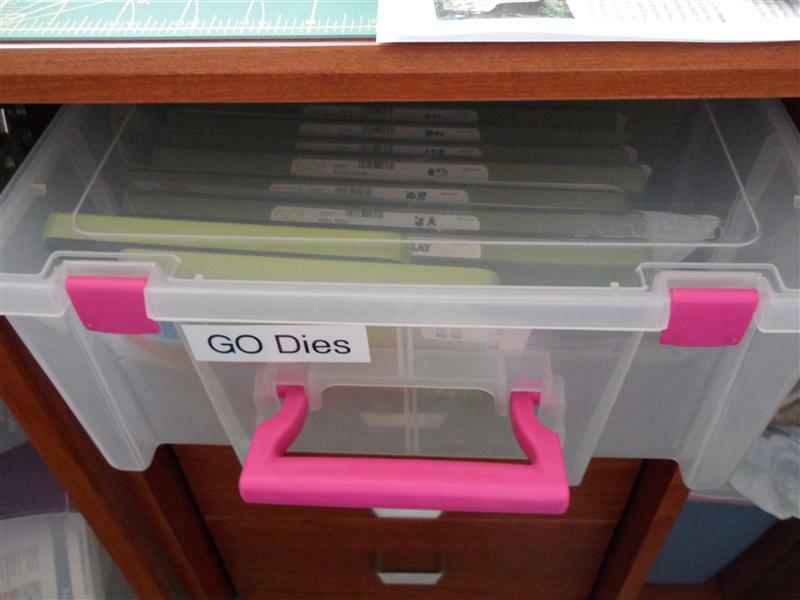 All the AccuQuit GO dies fit so nicely here in this little plastic container. It slides into a shelf on the cutting table. And...I was always tripping over my trash can, but I have to have it next to me when I'm cutting so I slipped it in the little center cubby spot. Fits perfectly. I think that spot was to put tall rulers and cutting mats or something, but I repurposed it. I actually have three trash containers in my room. One by my sewing chair for when I'm sewing which I move over by the Studio Cutter if I'm using it, one by the cutting cabinet and one big one over by the ironing board. Saves me so many steps each day and I keep my area cleaner. My view when I'm sewing. Wow...that really looks messy. Sorry. From the door. There really is a lot of room for moving around still considering how much stuff I have in there. I was gone the first three weeks in August so I've really only been in there to play for less than a week, but I'm enjoying my room very much. What a fabulous studio and so well organized. It looks like a wonderful place to spend the day. 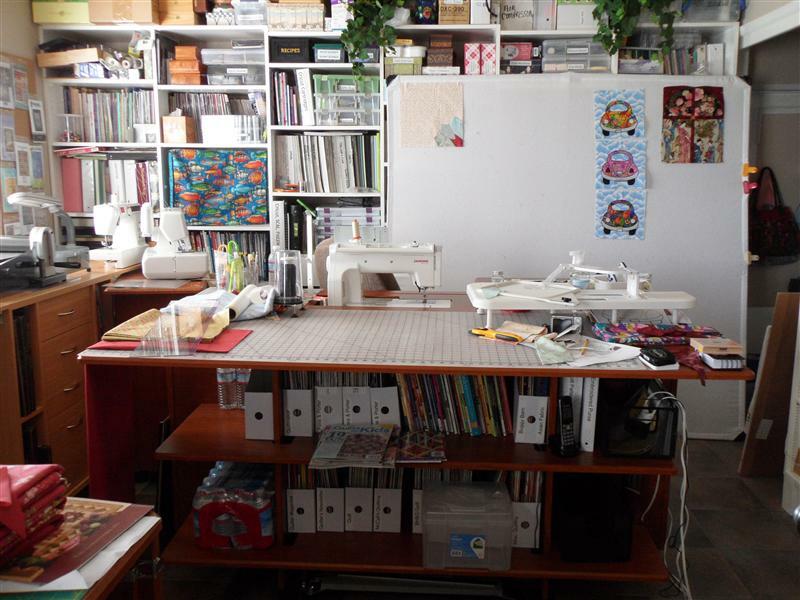 I always tell people that my studio is a work room, not a show room. That's my excuse for clutter and I'm sticking to it. Wow, what a wonderful space. It is like having your own quilt retreat, go in, close the door and forget the world outside! Thanks for letting us visit your creative space! Wonderful! Thank you for your complements. You're right about it being a nice retreat. It doesn't have a door. It's upstairs and at one end of the house, so everytime I go upstairs it's constantly beckoning me to just come on in.